SWFWMD seagrass study gets a tech-y facelift! The Southwest Florida Water Management District (SWFWMD) is responsible for managing water resources in the Southwest Florida region, from spring-fed rivers to saltwater estuaries. Seagrass beds are a vital resource that provides food and shelter for marine creatures. Of the many scientists employed by SWFWMD, their seagrass researchers are responsible for monitoring the health of seagrass in the region. Before October of 2018, surveying the aquatic plants required hours of surveying all the bays and harbors that host seagrasses. Seeking to reduce the amount of manpower required to fully understand Southwest Florida’s seagrass habitat, SWFWMD has debuted a brand-new monitoring method. High-resolution cameras take pictures of the beds from a birds-eye view. The photos then make their way to a computer where trained SWFWMD scientists draw boundaries where different aquatic habitats interact. The result? A perfect fusion of the power of STEM and human skill in making inferences. 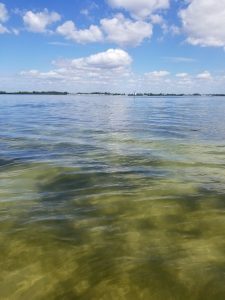 Since SWFWMD has been conducting this study, scientists have seen increases in the amount of seagrass in Southwest Florida’s estuary environments. Tampa Bay, Charlotte Harbor, and St. Joseph’s Sound estuaries now support over 50,000 acres of seagrass, the largest acreage of seagrass growth since the 1950s. Tampa Bay was even declared biologically dead in the 1970s. Water quality restoration efforts since then have kept murky, polluted water from reaching the Bay, allowing the seagrass to thrive. This dramatic positive change tells us that water clarity and quality are healthy enough for seagrass to thrive, providing habitat for dozens of species. To observe these biodiversity-rich seagrass beds, grab a mask and snorkel and head to your nearest Bay-side beach! Seagrass grows best in shallow water with low wave action. Keep an eye out for whelks, rays, and fish like seahorses hiding in the grass. Learn more about seagrass beds and the new SWFMD technology by watching this YouTube video.